Understanding what leads firms and their employees to register with the formal system and to declare their true income to the government are first order public finance issues for most economies around the world. For developing and middle-income countries, this is an important issue because of widespread tax non-compliance, poor enforcement of regulations, and low levels of social insurance coverage. Higher levels of registered employment and more reporting of income subject to payroll taxes would result in increased access to social insurance for workers and their families. Moreover, a reduction in tax non-compliance could also help remedy a variety of market distortions that limit economic growth and economic development (La Porta and Shleifer, 2008; Levy, 2008). This issue is also relevant in advanced economies with smaller but still sizeable underground sectors (Schneider, 2005). In a recent study (Bergolo and Cruces, 2014), we explore how social insurance programs shape individuals’ incentives to take up registered employment and to alter the reporting of earnings to the tax authorities. This question is addressed empirically by examining a large-scale policy change in Uruguay’s social insurance system. In Uruguay’s social insurance system, most benefits are made available only to employees registered with the social insurance administration who pay contributions and payroll taxes. Until 2007, a health insurance benefit was in place according to which the social insurance administration (SIA) covered the employee’s insurance premium from a private healthcare provider. However, the plan did not cover the employee’s family. 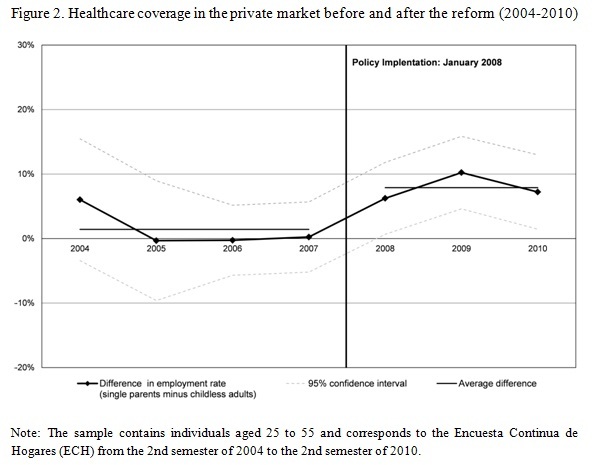 The 2008 reform extended the healthcare coverage funded by the SIA to include all registered employees’ dependent children under the age of 18 (Figure 1). The reform also increased the payroll tax contribution deducted from employees’ salaried earnings from three to six percent of wages. This health insurance benefit extension (HIBEX) reform modified several margins of adjustment for eligible individuals (i.e., adults with dependent children). The reform introduced incentives to move into benefit-eligible employment (i.e., 25 hours or more per week at a registered job) to take advantage of the subsidy for dependent children’s insurance premiums. The new benefit created an additional incentive for those not working to enter benefit-eligible employment, for those working in unregistered employment to formalize, and for registered workers below the 25-hour cut-off to increase their declared hours of work per week to at least 25. In addition, the reform could also have affected an additional margin of non-compliance, i.e, the underreporting of earnings to tax authorities to evade payroll tax and social insurance contributions. The HIBEX may have affected this form of non-compliance with the tax authorities because of the higher health insurance contribution rate and because those entering registered employment had to face the payroll taxes associated with the whole bundle of social insurance benefits. To test the above hypothesis the identification strategy relies on the fact that childless adults were not eligible for the benefit extension. Specifically, we estimate the impact of the reform using a difference-in-difference approach, comparing the behavioral responses of adults with children to that of childless individuals before and after the reform. The analysis is based on a pool of repeated cross-sections of a nationally representative Uruguayan household survey that covers three years prior to and after the reform. The empirical analysis suggests that the benefit extension had a significant effect on labor market outcomes for eligible individuals. Specifically, the number of individuals in benefit-eligible registered employment increased by 1.6 percentage points with respect to the comparison group, about 5 percent higher than the pre-reform level (Figure 2). The evidence suggests that this aggregate effect was mostly the result of a reduction in the number of those not working rather than a consequence of increased work hours among registered employees below the threshold, or a movement of unregistered workers to registered employment. The effects were substantially larger for single parents, parents with several children, and parents with younger children, for whom the reform represented a stronger financial incentive. For single parents, a sizeable fraction of the effect can be attributed to movements from unregistered to registered employment. The response from individuals in couples depended on the benefit eligibility of their partners, with larger effects on individuals with a partner whose employment health insurance arrangements did not already offer coverage to the couple’s children. Overall, these findings are in line with the theoretical literature on the effects of benefits tied to registered employment on individual choices between formal and informal employment (Levy, 2008; Galiani and Weinschelbaum, 2012). Additionally, our study finds that the extended benefit increased the incidence of underreporting of salaried earnings for individuals with children by about 4 percentage points, almost 25 percent higher than the pre-reform level. Moreover, this effect was confined to workers employed at small firms. This confirms the results of recent theoretical models (Kleven, Kreiner and Saez, 2009) and reinforces empirical findings found for other countries, including the United States (Chetty, Friedman and Saez, 2013). The findings of our research indicates that additional tax evasion margins of response mean complex trade-offs for workers and governments in the context of tax and benefit systems. In terms of tax evasion, the decision is not simply between off-the-book versus registered employment, but between full non-compliance, full compliance, and on-the-book salaried employment with under-the-table payments. These results confirm the insight that work incentives do not necessarily operate within the framework of the law and that the design of social insurance systems should take into account these additional dimensions. The implications of this analysis are relevant not only for developing economies with large informal labor forces. 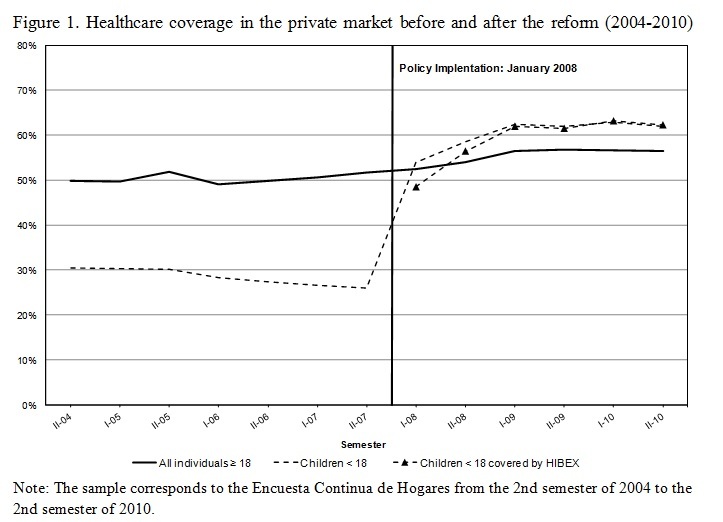 The policy consequences are also relevant for OECD countries, most of which have experienced an increase in their shadow economies over the past two decades (Schneider and Enste, 2000; Schneider, 2005); they may well face trade-offs similar to those described for Uruguay, at least for part of their labor forces. Moreover, it is necessary to understand the channels through which the tax and benefit system yields changes in evasion behavior in the context of salaried employment. For instance, it would be important to distinguish between situations where the employer and the employee collude to evade taxes from settings where the firm engages in unilateral evasion. Third- party information reporting (which has been highlighted as an effective measure to induce compliance) and other specifics of tax law and implementation details may also play an important role in the reduction of unregistered employment and of the informal sector in developing countries. Bergolo, M., Cruces, G. (2014).Work and tax evasion incentive effects of social insurance programs. Evidence from an employment-based benefit extension. Journal of Public Economics 117(September):211-228. Changing Fiscal Contracts in the Americas?